Markel (MKL) and Alleghany (Y) are more “Berkshire” type animals, with significant investments in operating businesses outside of insurance, as a form of genuine diversity. In that respect, after due recognition for the value of these businesses, we believe Alleghany offers a more interesting opportunity than the other three at present, and have acquired a new position. 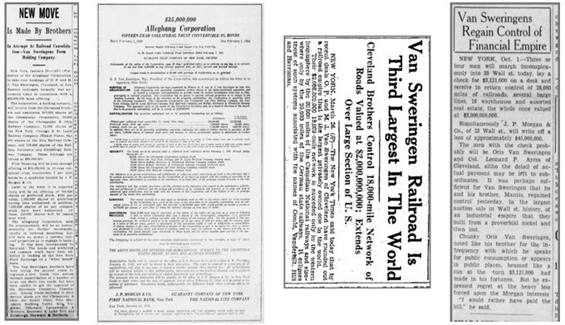 Alleghany is one of the great storied American corporations, having publicly floated in February 1929 as a means to bringing together the major railroad holdings – 20% of the US track miles at the time – of the legendary van Sweringen brothers31. Amidst allegations that monies from the public float had been used for stockmarket speculation, Alleghany’s fortunes withered and in 1935, the van Swerigans bought “back” control of the railroads after a public auction of $48million of debt owned by J P Morgan & Co. In the period since Robert Young took over as President in 1936, the company has had a mere five other leaders, even through a significant 1960’s proxy fight. Young effectively started the company’s move towards financial services acquiring control of Investors Diversified Services in the 1950’s – later sold to American Express in 1984. M. Kirby and John Burns. The bulk of the current insurance and reinsurance businesses were acquired between 2003 and 2012; the current President, Weston Hicks has been in place since 2004. This is a company imbued with long term thinking, conservative investment principles, and importantly, conservative insurance reserving principles. Alleghany has had consistent redundancy of prior years’ claims reserves over the past six years, averaging ~US$270million per annum (equivalent to $18.62/share). Alleghany has grown book value per share at a compound rate of 7.8% since 2000, with recent years hampered by the aforementioned catastrophe losses. When assessed against the cohort, it appears reasonably priced and gives us the desired exposure to premium (59c for every dollar of market value). 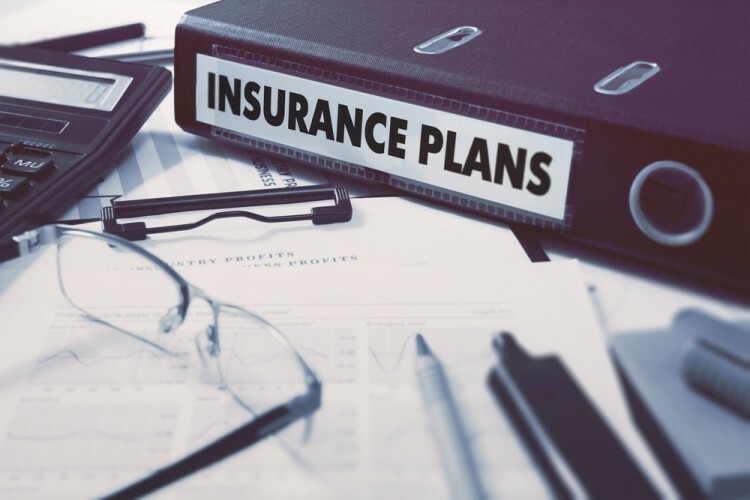 Deducting an appropriate value for the non-insurance activities ascribes an estimated price of 1.28x tangible book value for the insurance business. This compares favourably to its peers, and in absolute terms for quality global insurance exposure. Note that EXOR carries its reinsurance business, Partner Re, at the same 1.28x tangible equity value in the deconsolidated accounts. Alleghany Corporation is an investment holding company that was first established by Oris and Mantis Van Sweringen as a holding company for their railroad interests. The company owns and runs various subsidiaries and investments supported by strong positions in casualty and property insurance and reinsurance. Over the past 12 months, its stock gained 3.4%, and on April 9th it had a closing price of $609.11. Its market cap is of $8.81 billion, and the stock is trading at a price-to-earnings ratio of 232.48. At the end of the fourth quarter, a total of 19 of the hedge funds tracked by Insider Monkey were bullish on this stock, a change of -10% from the previous quarter. 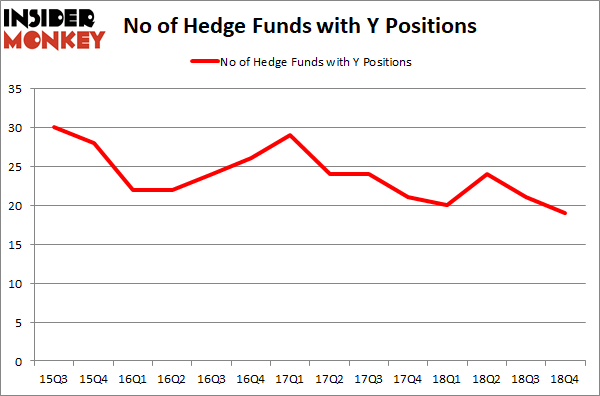 Below, you can check out the change in hedge fund sentiment towards Y over the last 14 quarters. So, let’s see which hedge funds were among the top holders of the stock and which hedge funds were making big moves. Of the funds tracked by Insider Monkey, Brian Ashford-Russell and Tim Woolley’s Polar Capital has the most valuable position in Alleghany Corporation (NYSE:Y), worth close to $83.5 million, amounting to 0.9% of its total 13F portfolio. The second largest stake is held by Royce & Associates, managed by Chuck Royce, which holds a $68.5 million position; 0.6% of its 13F portfolio is allocated to the stock. Some other hedge funds and institutional investors that are bullish comprise Cliff Asness’ AQR Capital Management, Daniel Johnson’s Gillson Capital and Daniel Lascano’s Lomas Capital Management.